“Pine resin has multiple uses for survival. 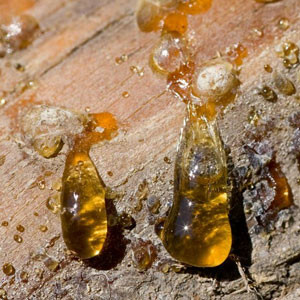 This sap is produced by the pine tree to seal up cuts or damages to the tree. If you ever find yourself lost in a wilderness environment, having a pine tree in the area is one of the best case scenarios you can hope for. There are many different species of pine trees but they generally prefer open and sunny areas. They are found abundantly throughout North America, they are also found throughout Central America, Europe, North Africa, in the Caribbean region, and in some places in Asia. ”You can also make turpentine if you distill the gum properly. You can even eat the bark (actually, the rich layer of inner bark) http://www.survivaltopics.com/survival/edible-pine-bark/” Quote from the comments on the actual page.